Exclusively for Toshiba, WIRED leveraged the power of its WIRED Insider community to showcase the new Ultrabook and elevate the perception of the brand as a leader in the premium laptop category. 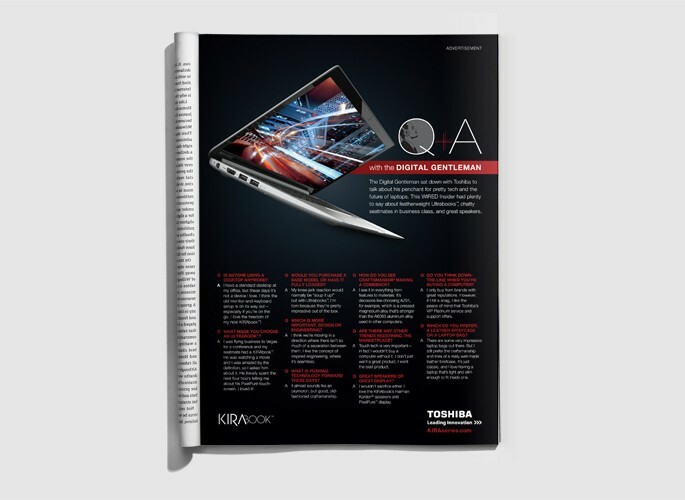 Toshiba was aligned with WIRED’s Ten Questions content on WIRED.com and custom print inserts were created to extend the theme inbook. Digital: In addition to a targeted media rotation across WIRED.com, Toshiba had exclusive sponsorship of WIRED’s Ten Questions content—an inspiring editorial series devoted to showcasing some of the brightest, most intelligent minds in business. The series posed ten thought-provoking questions to a selection of leading business people and showcased their answers. Print: To extend the 10 Questions theme to the pages of WIRED and consistently position Toshiba as a leader in the laptop world, a set of two custom single-leaf-inserts were developed in the voices of the WIRED Insider personalities, the Chief Disruptor and the Digital Gentleman.